I'm on spring break this week, and I thought a great way to celebrate would be with ice cream! Not only is it tasty, but it definitely makes you think of summer, which is just around the corner. 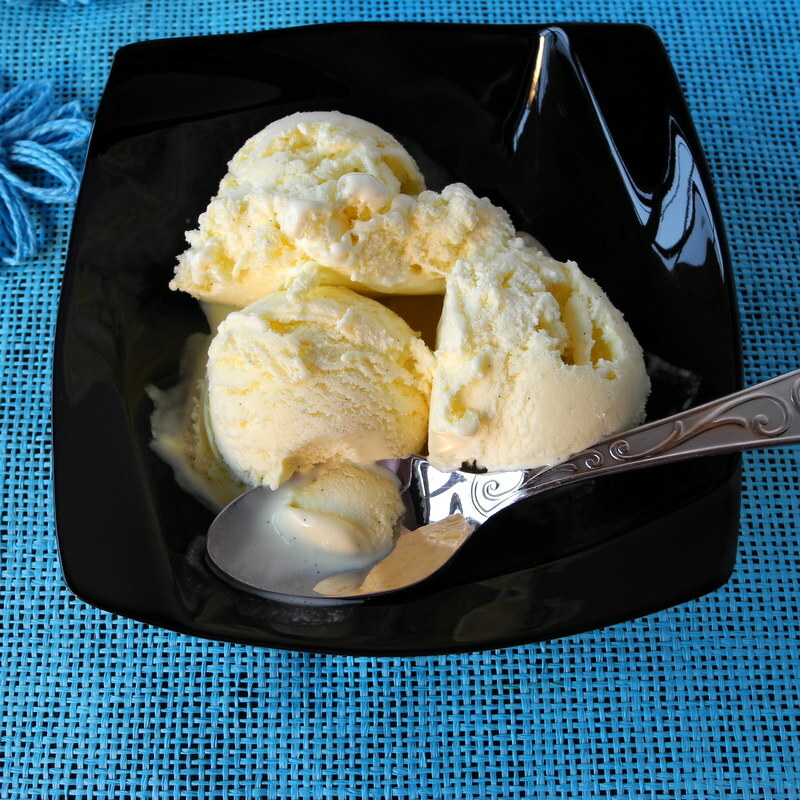 If you are looking for a super rich, super creamy, vanilla ice cream recipe, then this is it. It is a recipe I barely adapted from this one by David Lebovitz. Its richness comes from plenty of heavy cream and the egg yolks that also give it the nice yellow color. I think it was even better the second day after it had time to freeze a bit harder. I will say that this ice cream tastes quite different from the homemade ice cream I grew up with. It doesn't have that old fashioned homemade taste. They are both delicious, but they are different. But, it doesn't taste like it came from and ice cream shop either. Instead, this is the ice cream you might find on the menu of a gourmet restaurant. I would still like to find a recipe that tasted like the one I grew up with, but back then we put raw eggs in it, and I don't think I'm going to be able to capture the same flavor without them, and these days I definitely wouldn't serve raw eggs to guests. Heat the milk, half-and-half, salt, and sugar in a medium saucepan over medium heat until almost boiling (don’t allow to boil). Note that the original recipe called for all whole milk instead of half 2 percent and half half-and-half. I'm sure that it doesn't make much difference. I didn't have any whole milk, but I did have 2 percent and half-and-half, so I chose to do it this way. Remove from heat. Slice the vanilla beans in half length wise and scrape the seeds into the milk mixture. Add the scraped vanilla beans to the milk. Cover the pan and allow to sit for one hour so that them milk absorbs the flavor of the beans. Fill a large bowl with ice water and set another bowl inside it. The inside bowl needs to hold at least three quarts. Cover the inside bowl with a fine mesh strainer and pour the cream through it into the bowl. Put the egg yolks into the bowl of a stand mixer fitted with the whisk attachment. Remove the vanilla beans from the milk mixture and reheat it again until almost boiling. Turn the mixer on using the stir setting. Slowly pour the milk mixture into the egg yolks ¼ cup at a time. Don’t go too fast. You don’t want to end up with scrambled eggs. Pour the milk and egg mixture back into the saucepan and cook over low heat stirring constantly until the custard thickens enough to coat the back of a spoon. Pour the custard through the strainer into the heavy cream. Stir until cool and then stir in the vanilla extract. Chill several hours or until very cold. Pour the custard into the bowl of your ice cream maker and freeze using the manufacturer’s directions. Rich classic vanilla is always a great way to go because it is so versatile. You can always top this with your chosen flavors but you can't really take add ins out! This reminds me of younger days and summertime. Delicious post! oh yum, vanilla ice cream is such a classic! Saw your comment about raw eggs. I love to make caesar dressing, but won't use raw eggs either. Saw something online about buying pasteurized eggs to use in recipes calling for raw eggs. My Publix doesn't carry them, but Fresh Market or Whole Foods usually do. Good luck!